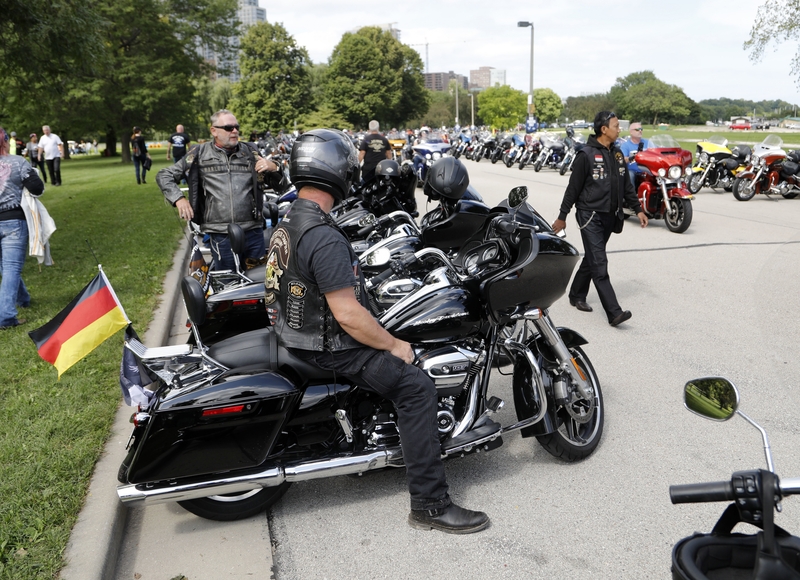 The line of motorcycles at the entrance to Harley-Davidson, Inc.'s 115th anniversary celebration at Milwaukee’s Veterans Park is at least a dozen deep. Riders of all ages grin and rev their engines at the sight of a radio microphone. A man with an impressive gray handlebar mustache flashes a grin and a blonde 20-something woman gives a thumbs up. The mood of the party is joyful. The riders have come from all over the world to celebrate a company that has given them what many say is more than a hobby — it’s a way of life. "The motorcycle, the road, the freedom that comes with it ... it sounds like a cliche, but it’s not," said Luis Burgos, who rode more than 2,000 miles to the party from California. Just as ready as Burgos and his compatriots are to extol the virtues of the open road, they’re prepared to weigh in on the political turmoil that’s been bubbling around the brand. In June, Harley announced  it had started planning to move some jobs overseas in response to retaliatory tariffs from Europe on its bikes. Those came after the United States imposed tariffs on imported steel and aluminum. Jim Nolan, who rode from Arizona, said he supports the tariffs, even though Harley estimates they’re going to cost the company around $100 million a year . "It’s going to sting in the beginning," Nolan said. "It’s going to hurt a little bit, but in the long run it’s going to benefit America." Nolan, and others who support the president’s tariffs, argue they send a strong message to countries that have had unfair trade practices for years. "Because other countries take advantage of the good guys," he said. According to a survey released last month by Marquette University , there’s a strong partisan divide on the president’s tariffs among Wisconsin voters. Almost 70 percent of Republicans surveyed think Harley-Davidson would have moved jobs overseas even if the tariffs didn’t happen. And many at Harley’s anniversary party don’t blame the company for its decision. "I don’t like it, but I do understand it," said Cecil Braisher, from Omaha, Nebraska. Patty Braisher, who has been riding Harleys with her husband for several years, agreed. "It’s a business, you have to do what you have to do," she said. Earlier this month, President Donald Trump tweeted  that many Harley owners plan to boycott the company because of its plans to cut jobs in the U.S.
"Many @harleydavidson owners plan to boycott the company if manufacturing moves overseas. Great!" Trump wrote. "Most other companies are coming in our direction, including Harley competitors. A really bad move! U.S. will soon have a level playing field, or better." The boycott hasn’t gotten much traction, according to Harley dealers . And there weren’t any riders at Harley’s anniversary party to be found who were keen on the idea. Mike Kyzer, who goes by the name "Bonehead" with his buddies, said the president needs to stay out of it. "He doesn’t tell me what shoes to wear, he doesn’t tell me what pants to wear, he doesn’t tell me what motorcycle to buy," Kyzer said. "He’s the president. That’s his job. Be the president." Half a dozen of Bonehead’s friends lifted their beer cans to toast that. They think the president should stay in his lane — and definitely not tell them what bike to ride.